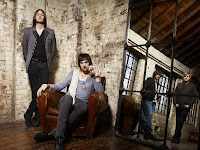 UK rock band Kasabian have a new record coming out. Their third studio record, West Ryder Pauper Lunatic Asylum, is due June 8 in the UK and June 9 here in the US. I had heard songs from this pending release and liked what I heard. 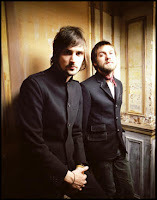 Those songs put me in the mood for a proper day of Kasabian listening (music player on repeat) and left me looking forward to the new release. Well, I got my hands on a copy of West Ryder Pauper Lunatic Asylum last week. I got it home, popped it in and I've been listening to it for several days now and haven't gotten bored with it. It should be noted, that this is a big deal for me since I categorize myself as a casual Kasabian listener. When I'm a casual listener of an artist, I tend to listen for a couple of days, get bored and then ignore it until something sparks my interest to listen to it again. This hasn't happened and I don't foresee it happening with West Ryder Pauper Lunatic Asylum as I'm honestly enjoying this work. My first thoughts were, "this sounds a bit retro." That doesn't mean it sounds old or dated or even that retro is a negative. West Ryder Pauper Lunatic Asylum is some serious electro psychedelic funk. There's a lot of fun rhythm on this record. You get a nice dose of late 60's psychedelia as well as vintage po p sounds mixed with current day electro dance all making for one heck of a rock album. "Swarfiga" is an instrumental that leaves me imagining this is what you would have heard if Booker T. & The M.G. 's had made music on the sunny beaches of California with a side trip to England instead of Memphis. "Fast Fuse" continues in the same groovy vibe where as "Take Aim" starts acoustic with vague South American flourishes before turning into a wicked mid-tempo groove ... nice. I wasn't sure about "Thick As Thieves" when I first heard it. But after a couple of listens I found myself enjoying the interesting slice of vintage pop mixed with the theatrical somewhat cabaret leanings it offers up. Somewhere along the line, they decided to channel classic Rolling Stones in "Ladies And Gentleman (Roll The Dice)" and "Happiness." These songs are what you'd imagine The Stones would sound like if they still released good songs. The highlight songs of the album are the previously mentioned "Swarfiga" and "Vlad The Impaler" with it's serious dirty groove; it beckons you to some hot, sweaty, questionable club to dance half naked pressed against strangers while not giving a damn. If there isn't already a remix for this song, I fully expect one. "Fire," which at the moment is my favorite of the 12 songs, for some reason, during the low key moments reminds me of Jim Morrison and begs me to hippy dance. These low key moments are surrounded by and kick into a modern day dance floor rev up. Would I recommend West Ryder Pauper Lunatic Asylum? It's an overall good record that casual listeners such as myself can fully enjoy as well as those who consider themselves fans. So, you bet your sweet funky backside I would recommend it.